"They haven't done 'Alive' yet," says someone, and I respond "Not necessarily" (prompting some wiseass to label this song as "not necessarily alive"), and I'm still recovering from the previous song and the flood of emotions when before I know it, Eddie says, "Bailey, here we go" and HE WALKS OUT INTO THE CROWD! I am cursing the fact that my camera battery has completely died (thank goodness we had three cameras among five people). OH MY GOD! When was the last time we saw THAT? And the place, quite rightly, is going bananas. 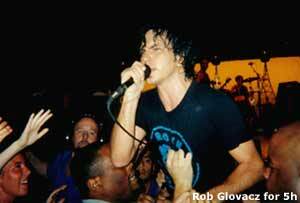 To their credit, they let Eddie out into the crowd and emerge relatively unscathed." With the European tour 2000 dates announced, one cannot help but speculate about what's "around the bend." Our thoughts also turn to shows past. 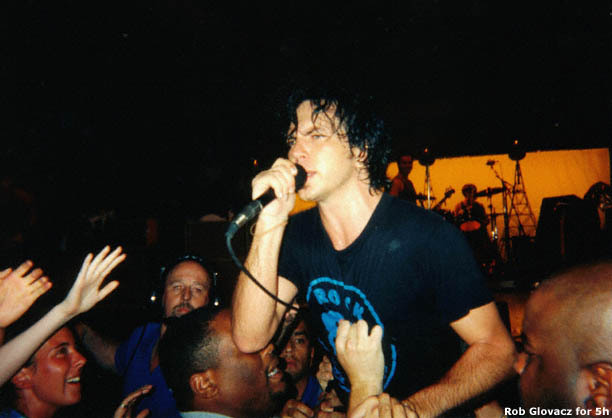 Here is a little revisitation to 1998, with this photo taken at the Vancouver show on July 19, 1998, the last show prior to PJ's return to hometown Seattle. Ed surprised everyone by going into the crowd during the long "Alive" interlude.